Beauty By Shannon: Hair Care Routine for Hip Length Curly Dry hair. Today we are talking HAIR! My hair specifically. 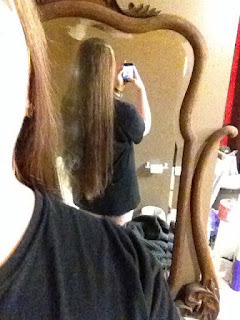 I have very thick, (To the point I have, multiple times gone to the hair dresser and gotten it thinned out!) Curly, Dry, and Long hair! In the shower: I will wash my bangs/scalp with either Clear hydrating cream shampoo, or Dove Oxygen Moisture shampoo. Both of these shampoo's leave my hair feeling non greasy, but they don't give that SQUEEKY clean feeling. My hair feels soft and fluffy! I DO NOT wash the length/tips of my hair! Then, I will go in with Either Aussie Moist conditioner if it's the summer. But if it's fall/winter, I'll go in with BE Argan Oil hair mask, or my all time favourite, holy grail conditioner, AKA John Frieda Shea Butter hair mask. The shea butter hair mask is SO thick, I like to buy packs of this mask at a time and debaggy it into a plastic container, where I will scoop out as much as I need! All of these masks leave a NOTICEABLE difference in my hair! After the shower: I will "Wring" out my hair in the bathtub after turning the water off to get excess water out. Then I'll get out and wrap my hair up in a towel. After It's been in the towel for 5 to 10 minutes, I'll shake it out, and lightly rub the towel over my lengths to get any extra, left over water! THEN, I'll part my hair. And take a pump of Macadamia Nourishing Curl Creme and spread that from my ears to my tips, lightly scrunching as I go. I'll then take 5ish sprays of Arganistry Keratin Smoothing Leave in Conditioner into my palm, then pat my hands together and smooth this Keratin Leave in conditioner from my breast area length to my tips! Lastly, I'll take 3 pumps of this Garnier Oil. I USUALLY Use HASK hair oils. As those are my favourites. But My walmart was sold out of them, so I'v been using up this. I'll take the 3 pumps, spread the thick oil over both hands, and massage this into my very tips for extra moisture! For hold: I'll use this Herbal Essences Naked "flexible hold" Spritzer. It's basically a very low hold hair spray! I'll use this in my bangs when I wear them down. Or when my hair is in a bun I'll spray this all over to give light hold! For heat protection: I'll use this Got2b "Mind Blowing Styling spray" It's for protecting your hair from heat damage when blow drying. But I NEVER use a hair dryer. I use this for when I flat iron my hair, and my hair always is left shiny, and soft when I flat iron with this! Dry Shampoo: I wash my scalp twice a week with the shampoo's up top. The rest of the time, I sprinkle with Grapefruit scented dry shampoo powder into my palms, and then massage this into my scalp! This is SUCH a good value for your money compared to spray dry shampoos. I was going through 2 cans a month of spray dry shampoo. This, i'v owned for 6 months. And it's not even 1/4 used up. I love the scent, and the way this soaks up excess oil without stripping and leaving a very white, powdery look in my dark hair! Lastly, my Flat Iron! I use Avanri (???) Ultra Nano-Silver Flat iron! I bought this flat iron in a salon in my town, EIGHT years ago. This bad boy is AMAZING. It goes up to 250+ degree's, it doesn't leave my hair all static-y, nor does it fry my hair off. I personally think, it's 1000% worth it to invest in a great flat iron, and heat protection spray/cream. This is my hair flat ironed! When it's natural it's a LOT shorter haha!